As a listing agent, you can set up 'Advanced Notifications' or 'Rescue Notifications' to help prevent owners from canceling showing requests, or to inform you when a showing is in danger of not taking place due to not being confirmed. Select the Listing you want to configure advanced notifications on. Advanced Notifications are defaulted to No, but are easily configured by selecting the Yes option next to either of the advanced notification methods, then choosing the preferred method of contact (Text Message, Email or Automated Phone Call, known as ShowingVoice). A request can be escalated when a showing is in danger of not taking place due to not being confirmed. Escalated Appointments will notify a contact so they can confirm the appointment. Escalation times can vary depending on when the appointment was originally scheduled & how much lead time has been provided, as outlined below. These appointments will be escalated anywhere between immediately to 2 hrs. before the appointment's start time. These appointments will be escalated anywhere between 2 hrs. before the appointment's start time to 7 PM the prior day. Appointment Moderation allows any Listing Agent or Co-Listing Agent to be notified when an Owner or Occupant has canceled or declined an appointment. 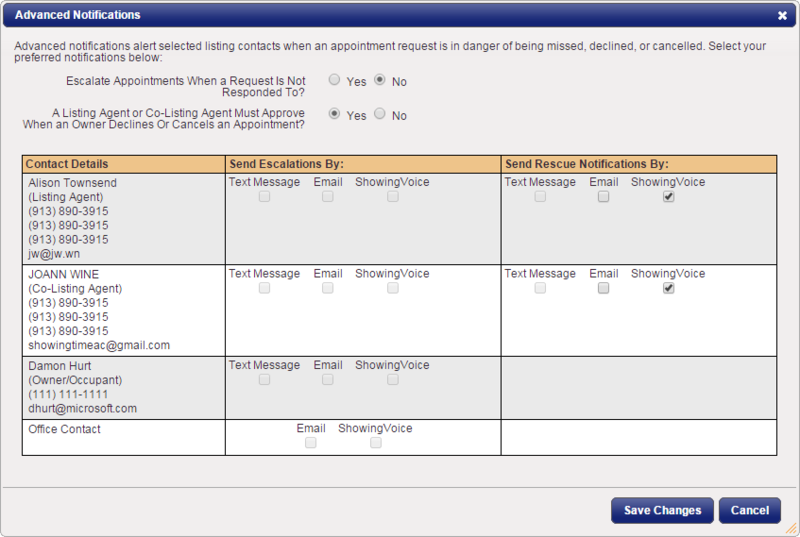 This allows either agent to have the last say in whether or not the appointment should be canceled or declined. This is useful as most appointments canceled by the seller are because they might not be available during the requested time. This option will only be available if the owner or occupant has been configured to confirm the appointment, and has been configured to receive email notifications.